Author(s): Simin D. Maleknia, Kevin M. Downard. Prince of Wales Clinical School, University of New South Wales, Sydney, NSW 2052, Australia. Background: A resurgent interest in the use of natural product based inhibitors against the influenza virus has resulted from the widespread resistance to current antiviral therapeutics among circulating strains. Natural products derived from food sources in particular, offer the benefit of a safer pharmacological profile and may offer broader health benefits. Objective: To identify new anthocyanins from black elderberry (Sambucus nigra) that will inhibit the function of influenza neuraminidase while avoiding complications associated with mutations in the active site of strains resistant to current inhibitors. Method: The mild solvent extraction process minimizes the exposure of the anthocyanins to non-acidic pH solutions, high temperature and pressure, and ambient light, in order to prevent their chemical transformation or degradation. Total anthocyanin yields are equivalent or better to those reported based on the recovery of cyanidin-3-O-glucoside. The characterization of additional anthocyanin components has been achieved by liquid chromatography coupled to electrospray ionization mass spectrometry (LC-ESI-MS) in conjunction with tandem mass spectrometry (MS/MS). Results: The results demonstrate an improved mild recovery method that has enabled the isolation and detection of previously unidentified minor anthocyanin components in elderberry of inhibitory potential against the influenza virus including prenylated cyanidin-3-O-sambubioside, prenylated and other derivatives of cyanidin-3-acetylrutinoside, and a type A proanthocyanin dimer of cyanidin-3-O-sambubioside. Conclusion: The improved recovery of anthocyanins from elderberries, under mild extraction conditions in a manner that preserves their structural integrity, and which yields a wider variety of previously unidentified compounds, should aid in their use and development in the treatment of influenza infections. 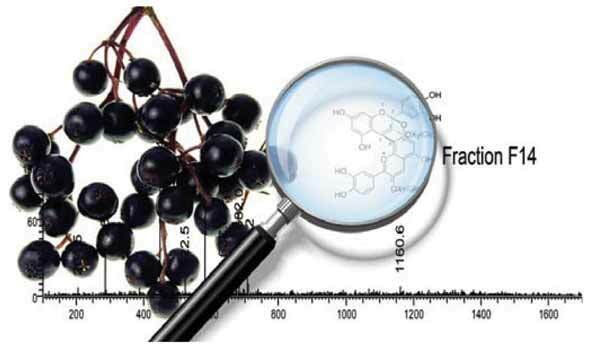 Keywords: Anthocyanin, elderberry, extraction, influenza, virus, inhibitor, mass spectrometry. Affiliation:Prince of Wales Clinical School, University of New South Wales, Sydney, NSW 2052, Australia. Keywords:Anthocyanin, elderberry, extraction, influenza, virus, inhibitor, mass spectrometry. Abstract:Background: A resurgent interest in the use of natural product based inhibitors against the influenza virus has resulted from the widespread resistance to current antiviral therapeutics among circulating strains. Natural products derived from food sources in particular, offer the benefit of a safer pharmacological profile and may offer broader health benefits.